The Apple Store website is down! This is quite possibly the only website in history that when it goes down, millions of people get excited. That’s because when the Apple Store website goes down, it means new goodies are on their way. The rumored “newness” this time however isn’t going to be a new iPhone, or even a new iPad. According to Engadget, Apple’s got a new lineup of Mac Pros and some updated iMacs to show you. 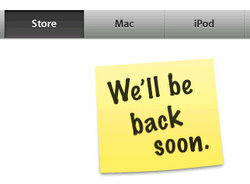 As is typical for Apple, we can expect the Apple Store to be back up around 8:30’ish, in standard Apple fashion.